And so I've come to Day 365 of the Daily Beethoven project. It's been a long journey and I've certainly learned alot. 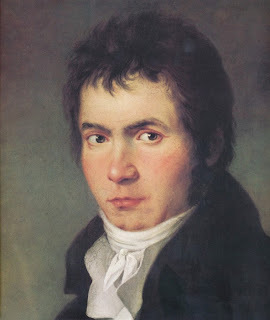 The original idea behind starting this blog was just to put my favorite Beethoven links in one place, and somehow along the way I started getting into analyzing his compositions, posting pictures of historical artifacts, visiting his place of business (Vienna trip) and even making videos of my own "rock" transcriptions of his works. I believe there are a couple dozen of you regular readers who have stuck with this blog all this time. Thanks! I have certainly met a few cool Beethoven fans out there through this blog. In the short term, I'll probably just add to the posts already here, since there are now a completes set of 365 articles, one for each day of the year. The Index of Works is already getting quite unwieldy (28 references to the 5th Symphony!) so to make new posts about Razumovsky No. 1 (again) seems a bit redundant. However I will try to keep an eye on the videos that I've posted from other peoples' channels (in case they get deleted) and try to keep this site a 1-stop spot for finding live complete performances of all of Beethoven's major works. Eventually I'll probably start adding new posts if some new earth-shattering insights come up. I'll also continue to add videos to my Youtube Channel, especially once I start doing wave-form analyses again of the remaining piano sonatas and symphonies (Update: symphonies and string quartets are now done). "Beethoven broke all the rules, and turned out pieces of breath-taking rightness. Rightness – that’s the word! When you get the feeling that whatever note succeeds the last is the only possible note that can rightly happen at that instant, in that context, then chances are you’re listening to Beethoven. Melodies, fugues, rhythms – leave them to the Tchaikovskys and Hindemiths and Ravels. Our boy has the real goods, the stuff from Heaven, the power to make you feel at the finish: Something is right in the world. There is something that checks throughout, that follows its own law consistently: something we can trust, that will never let us down." I've added your blog to the links at the bottom. Thanks for some great information on Beethoven. I will be checking back frequently. Thanks! I enjoyed checking out your blog. I'll add you as well. Thanks for a great year of work! What a fantastic site for exploring Beethoven. Thank you for having this blog - it's very refreshing and unique in a way that is devoted specially to Beethoven, one of my favorite composers. Please feel free to visit my learn piano blog too! I hope your posts are available for a long time to come! Excellent work with this blog. And thanks for the Rave/Moonlight link. Very nice listen. Thanks for the comments everyone! I should probably post more articles but all my time right now is being spent on YouTube analysis videos. Check my channel for continuing updates :).